On Saturday, June 30, The Flash Podcast hosts Andy Behbakht, Swara Salih, Andrew Dyce and Brittany Rivera came together for DC TV Podcasts’ fourth annual charity podcast marathon to raise money for Make-A-Wish! 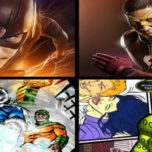 For the first time in the podcast’s history, the gang hosted The Flash Podcast Awards for Season 4 of the Fastest Man Alive. In addition to that, Brittany shares a special announcement with the listeners that you’ll want to tune in to in case you missed the live show.